Watch your baby figure out that pressing on the giraffe?s head leads to ball-chasing fun, and chase the balls all over the floor! The POPPIN? PARK Kickin? Giraffe kicks balls all over every time your baby presses on the giraffe?s head! Put the balls in the monkey chute, then show your baby how to do it. Giraffe toy comes with 2 balls. 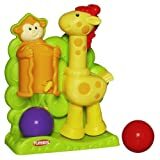 It’s one ball-chasing surprise after another with this adorable POPPIN’ PARK Kickin’ Giraffe toy! It’s Grover to the rescue! 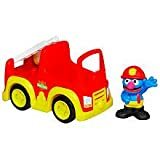 Whether he’s putting out fires or helping kittens caught in trees, Fireman Grover rushes in to save the day! Size of fire truck is approx. 6″ x 3″ x 4″. Ladder Pivots up for rescuing action! Campatible with Sesame Street Playsets!